Lumache, similar to Canestri or a wide Maccheroni, holds a ragu beautifully with its ribbon skin and wide opening through the center! 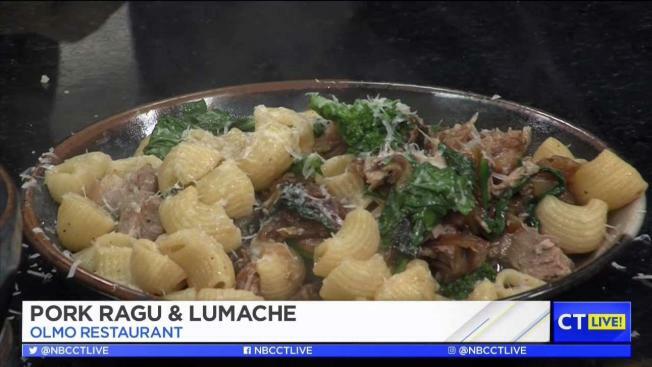 We chose to serve this fun pasta with a pork shoulder ragu that starts with braising the pork in a bath of aromatics and light spices. To bring on more depth the addition of caramelized onions is added and to balance the bowl of yummy is a bitter green in charred broccoli rabe. This dish may look heavy, but when cooked with love can come out bright and refreshing. 2. Once browned place pork into a braising pan, use the same pan and char the onion by cutting it in half, removing the skin, and placing it face down on the surface. Burn the face of the onion and then place in with the pork shoulder. 3. Add black pepper, mustard seed, salt, tarragon, thyme, and chicken stock into the braising pan. Cover with tin foil and place in oven for 3 hours or until fork pulling tender. 4. While pork is cooking, julienne a large yellow onion and cook in cast iron pan from above with butter. Season with salt. Stir on low heat until onions are dark brown and sweet. Set caramelized onions aside. 6. Remove the pork from oven and pick into extra wide saucepan that will be used for pasta sauce. Strain the braising liquid into a separate container and reserve. 7. Add 1 cup of braising liquid, onion, and broccoli to the pork saucepan. Taste for salt and pepper - this is crucial before you cook pasta. 8. In a large pot of boiling water (we do not season our pasta water) add the pasta and cook for 1 minute then strain - reserving some pasta water for insurance. 9. Immediately add the pasta to the saucey porky awesomeness and cook on high heat. The pasta will soak up the braising liquid and that means to add more. Add braising liquid and stir the pasta until pasta is cooked through, about 3 minutes on high heat. 10. At this point, when pasta is perfectly cooked, add half the pecorino romano and stir off heat. If the cheese makes the sauce look dry, add braising liquid or reserved pasta water until the sauce is enveloping all the noodles and the pork looks wet! 11. Serve with mounds of bread and the rest of the cheese! If you like very bright pasta like we do, squeeze half a lemon over the top to finish.